On Raw Silk Uncut Wood, Laurel Halo shifts her typically synthetic, dense approach to raw, uncut minimalism. While Laurel Halo's debut album Quarantine received much critical acclaim in 2012, she has done little to feed off the hype and everything to subvert expectations. What seemed to be her defining aesthetic moment quickly became a sound of the past as she boldly treaded onto new genre-bending excursions. Never settling into any stylistic territories, Halo's projects can be described by a litany of music descriptors: alt-pop, Detroit techno, IDM, and more. Hence, rather than a particular sound, Laurel Halo has become an artist that is defined by her versatility and the underlying perspective that brings it all together. 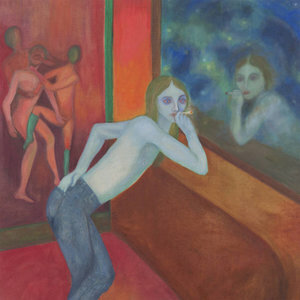 Laurel Halo's latest mini-album Raw Silk Uncut Wood continues her ever-evolving aesthetic journey into the new territory of raw sounds and uncut compositions, as alluded by the Tao Te Ching inspired album title. Her typically synthetic productions are supplemented by organic textures, collaborating with the cellist Oliver Coates and percussionist Eli Keszler. Her erratic song structures are focused into linear movements, resembling her recent soundtrack work on the Metahaven and Rob Schröder film Possessed. These radical changes culminate in six immersive compositions, in which moments, scenic or manic, are meditated upon to the fullest. Raw Silk begins with the title track, a 10-minute instrumental that immediately establishes Halo's departure from the vocal-driven aesthetic of her 2017 album Dust. In the absence of a leading voice or guiding beat, textures venture with volition, sometimes veering into each other's lane. The humble keyboard progression leads the trip, as Oliver Coates follows with the melancholic cello, and intermittently, an overpowering organ crashes in, drowning out everything in its sonic path. It feels as if you just hit the nine-hour driving mark on a lost highway, slowly losing consciousness until a sudden swerve wakes up your hypnagogic car ride. As the opening track conjures a vivid scene, Halo prefaces her intentions to elicit such filmic moments throughout the mini-album. Following the extended, scenic introduction, Raw Silk is compellingly disarranged by a trio of short, manic tracks. "Mercury" begins the descent into madness with Halo's abstraction of jazz. Bleak piano chords ring in time, as Eli Keszler drums into calamity. The snare and drumstick rolls stagger on top of each other, the cymbals clang in erratic successions, and the muffled toms rumble underneath it all. Next, "Quietude" progresses the hysteria with Halo's exploration into plunderphonics. Keyboard sounds are cut and looped until they lose their musical functions. The samples flitter in alternating series, sharp and loud, then blunt and low, until it harshly climaxes in a nearly unbearable frequency. Lastly, "The Sick Mind" completes the manic breakdown with Halo's deranged piano composition. In the similar effect of Nikolai Rimsky-Korsakov's "Flight of the Bumblebee", layers of piano arpeggios circle relentlessly, as bass tones and 808 cowbells periodically chime in. It is a full embrace of the chaos "Mercury" commenced. After the trio of manic tracks, the ambient interval "Supine" provides a brief resolve. Harmonious layers of shimmering electric pads, bouncing periphery synths, and an undulating holographic bass create a daunting wave of sound. However, the masterful production leaves you desiring more as it only drones for a minute and a half. Perhaps, following the trio of maddening songs, the briefness of "Supine" alludes to a fleeting cathartic moment that lifts you out from the torpor. Regardless, it, fortunately, leads into an even more beautiful, fully fleshed out closing track. Raw Silk closes as it opened, with another 10-minute composition on "Nahbarkeit". The collaborative potential of Halo, Coates, and Keszler is fully realized as they share the most gorgeous song of the mini-album. The ambient piece begins with an entrancing conflict. Halo's synthesizers softly float over Keszler's banging drums. The dueling timbres ominously push forward as the synthesizers travel up the scale and various percussive instruments patter in the distance. However, once the noise dissolves, Coates' cello enters with a heavenly solo that makes sense of all the tension. By the end, the aforementioned conflict feels harmonious. The nuanced progression embraces contradictions and unfolds beauty in dissonance. Whether Raw Silk Uncut Wood is the precursor to a forthcoming ambient full-length or just another stint of experimentation, Laurel Halo continues to break expectations in the most bemusing way. The mini-album is a beautiful practice of minimalism that also maintains her intricate perspective. Abstract ideas about instrumentation are explored with a handful of sounds; sweeping emotions and immersive environments are achieved within a linear song structure. Each composition reiterates that minimalism does not translate to simple or easy. Rather, it is about meditating on the basics to uncover their full potentials. As Ursula Le Guin translates Lao Tzu's Tao Te Ching, "what works reliably is to know the raw silk, hold the uncut wood… Forget the rules."